Who in the World is David Pauley? Quick, who replaced Cliff Lee in the Seattle Mariners’ rotation? Nope, not Erik Bedard or Michael Pineda. Try David Pauley. Who? The 27-year-old righty sports a 3.31 ERA through his first 10 appearances this season. With the Mariners already holding two fantasy league sleepers in their rotation this season – Jason Vargas and Doug Fister – could Pauley be the next pitcher to benefit from Seattle’s pitcher-friendly home park and excellent defense? Maybe. Pauley has bounced around since being drafted in the eighth round of the 2001 draft by the San Diego Padres. Three years later, San Diego traded him to the Boston Red Sox in the Dave Roberts deal, who then sent him to the Baltimore Orioles five years later. After reaching minor league free agency this past winter, Pauley inked with the Mariners, where he probably did not expect to join a rotation stacked with names like Felix Hernandez, Bedard, and Lee. Yet, here he is. Pauley had only 28 major league innings entering this season, with mixed results. 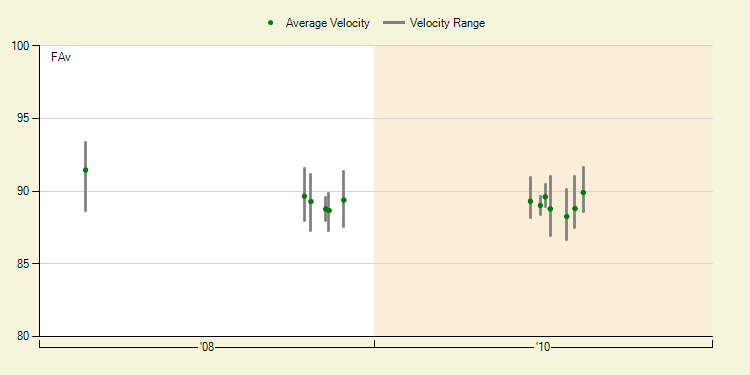 His ERA was awful, and still is, but his underlying peripherals suggested he wasn’t that bad. For instance, his FIP this season is 3.91, whereas his career mark is 4.18. Even with a fastball that sits below 90 (check the chart below, he really does not throw hard), Pauley manages to get a league-average amount of whiffs, thanks to heavy usage of his change-up. In 85 minor league innings this season, Pauley posted a 3.68 ERA. The last time he flashed an ERA over 4.50 in the minors came in 2006, during his first stint in Triple-A. Since then he’s posted ERAs of 4.33, 3.55, 4.37, and the aforementioned 3.68. Most projection systems have Pauley with a much higher ERA than league average, but that seems harsh considering his ability to get groundballs while pitching in front of a grade-A defense and in a park that restricts power. That doesn’t mean Pauley is a must-get in your league. He’s hardly that, but he is owned in less than 1% of ESPN leagues. So if you’re in an AL-only or deep mixed league, Pauley is worth a shot.